Lightning McQueen (Owen Wilson) revs up for a victory lap and a chance at one last cup before he’s pushed out of the spotlight by the new cars on the block. 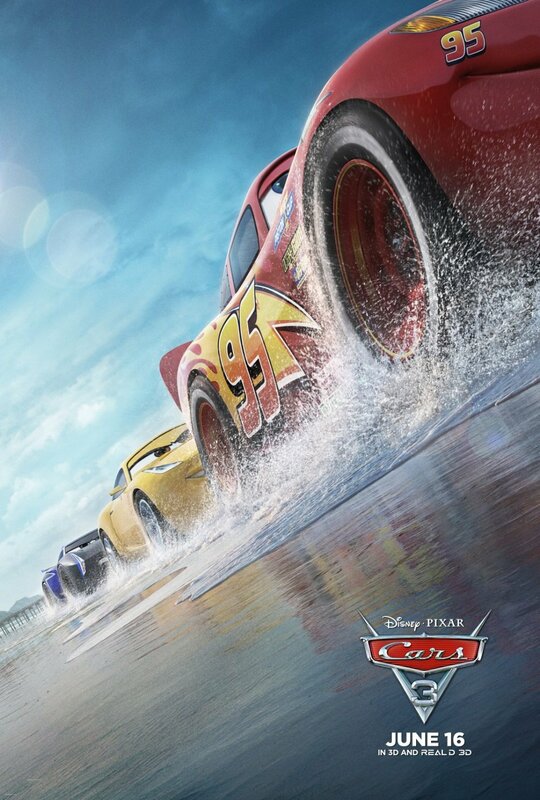 This last film of the ‘Cars’ trilogy excites only the unwavering fan of the franchise. However, I will submit that ‘Cars 3’ tied a satisfying bow on a trilogy that may have otherwise lost its novelty over the years. The first ‘Cars’ movie was wildly underappreciated by the critic community, but has held vacancy in the hearts of viewers. Although I disagreed with many critics in their analyses of the original movie, I can stand firmly behind the idea that the second of the three drove way off track. At best, it is the old beat-up Camaro that dad doesn’t want to bring to the dump. But I digress. ‘Cars 3,’ while staunchly predictable, softens up the viewer to the all-so-familiar Pixar feel-good narrative. It may fall short in the echelon of movie sequels, but I enjoyed the journey it takes you on. Not to forget, however, how egregiously ‘okay’ the screenwriters were with making the plot unsurprising, the jokes repeated to the point of annoyance, and the odd use of modern technology that felt foreign in a world of 80s vehicles. But hey, the kids will love it. The first act of the movie, the explanation of the story world so-to-speak, is brief because if you haven’t gotten it by the third movie than you don’t deserve an idiomatic setup. That being said, ‘Cars 3’ derails when the hero’s journey begins. The strange introductions to new characters, the pathetically lazy montages, the passive protagonist, all contribute to an at-times unbearable middle act. More importantly, perhaps, is an ending that saves the legacy of the trilogy. It offers the opportunity for a ‘Cars 4,’ not that we’re asking for it, but the opportunity exists nevertheless. As stated in the opening sentence, this movie could only possibly be enjoyed by the youngest of kids or the most delusional of Pixar fanatics. However, the message (because there is always a deeper meaning with Pixar) transcends age and intelligence. It is, simply put, the idea of the underdog. The veteran. The Rocky Balboa that is fighting for relevance. The fifty-something near retirement with nothing on the horizon. The middle age crisis of longing for purpose. The student becomes the teacher saga. A beautifully cyclical poem or a connecting puzzle that just makes sense. As unapologetically foreseeable as the plot of ‘Cars 3’ is, give it a pass for making us smile in the end. Good save Pixar. I am a 2017 graduate of the School of Communication at American University in Washington, D.C. I received my degree in Film Production, I am a strong believer in cinema and I'm a storyteller at heart with an insatiable curiosity. I have editing/design experience with the Adobe Creative Suite; acting experience in theater productions and low-budget shorts; writing experience through two feature film scripts, two television spec scripts and a compelling (read: not-so compelling) blog. Lastly, I've gained cinematography experience while working with the Canon 5D, C100, DJI Phantom 4 Pro Quadcopter, Osmo Handheld, Panasonic AG-DVX200 4K, and ARRI Arriflex 16mm cameras. Suffice to say, I love film. I am also a fan of hikes, travel, craft beer, singing in the shower, the Yankees, Survivor, and of course, chocolate chip cookies.